Line two greased 15x10x1-in. baking pans with waxed paper. Prepare cake mix according to package directions. Divide batter evenly into prepared pans, spreading evenly. Bake at 350° for 12-15 minutes or until tops spring back when lightly touched. Cool for 5 minutes. Invert each cake onto a kitchen towel dusted with confectioners' sugar. Gently peel off paper. Roll up cake in the towel jelly-roll style, starting with a short side. Cool completely on a wire rack. In a small bowl, mix whipped topping and extract until blended. Unroll cakes; spread each with 1-1/2 cups peppermint mixture to within 1/2 in. of edges. Cut a small hole in the corner of a food-safe plastic bag; fill with fudge topping. Drizzle each cake with half of the fudge topping; sprinkle with 2 tablespoons crushed candies. Roll up again, without towel. Transfer to platters. 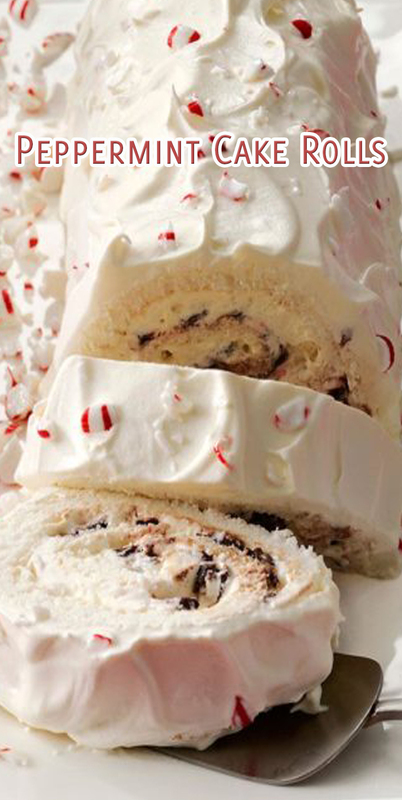 Frost with remaining peppermint mixture. Just before serving, top with remaining candies and, if desired, mint leaves. Freeze option: Omit candy topping and mint leaves. Place frosted cakes in airtight freezer containers; cover and freeze. Remove from freezer 10 minutes before serving. Top with remaining candies and, if desired, mint leaves.